Are NFL Football Hits Getting Harder And More Dangerous? : Shots - Health News In the early days of the NFL, the average lineman weighed 190 pounds. Now they average 300 pounds. A look at the physics behind a tackle shows that bigger and faster players means harder slams to the turf and more severe injuries. Are NFL Football Hits Getting Harder And More Dangerous? Super Bowl XLVII will kick off Sunday with its typical bombastic fanfare: Beyonce will wow us with her live halftime show, and "space baby" commercials will overload us with cuteness. But this year, there's a gray cloud hanging over the Super Bowl: the mounting anger about devastating injuries to players' brains and bodies. Thousands of former NFL players are suing the league over allegations that it covered up brain injuries. Even President Obama is concerned: On Jan. 26, he lamented the violence of football in an interview with The New Republic. But tough, rowdy NFL linemen have been taking down unsuspecting quarterbacks for almost a century. Have hits really gotten harder — and more dangerous — in recent years? That's a complicated question, says Timothy Gay, a physicist at the University of Nebraska and author of Football Physics: The Science of the Game. But a look at the physics behind a tackle suggests that the answer is yes, Gay says. One thing is for certain — football players have gotten much bigger and faster. And the laws of physics tell us that the force of a hit depends on three factors: body weight, speed and how quickly the players stop moving. 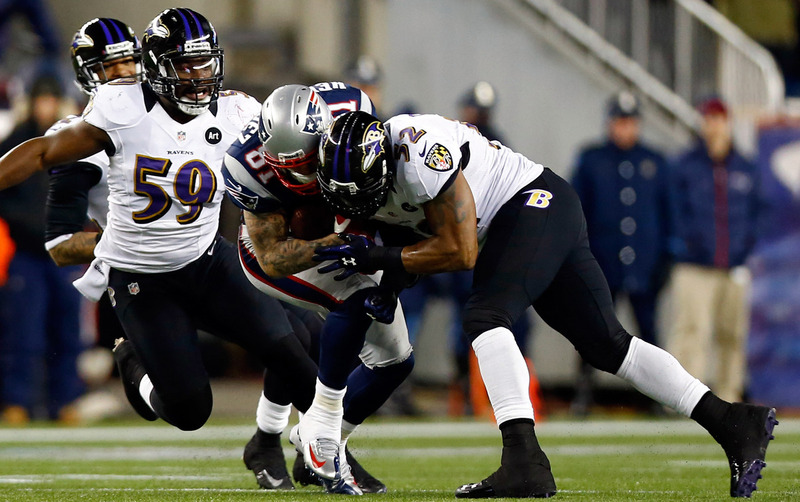 Baltimore Ravens Ray Lewis tackles New England Patriots Aaron Hernandez with his helmet during the 2013 AFC Championship game this year. Back in the 1920s, when the NFL was just getting started, the average lineman weighed only about 190 pounds. Now they average 300 pounds. That means Hall of Famer Morris "Red" Badgro, who played for the New York Giants in 1930, would lay down quarterbacks with about 970 pounds of force, according to Newton's second law (and a bunch of simplifications). In contrast, Baltimore Ravens starting lineman Haloti Ngata weighs 335 pounds and runs the 40-yard dash in just under five seconds. If he sacks Colin Kaepernick on Sunday, he'll unleash about 1,700 pounds of force. In other words, getting stopped by Ngata is literally like having nearly a ton of bricks fall on you. "These are very strong forces," Gay says. "This is why they call football a contact sport." Athletes can usually handle these hits when the energy and force spread across the whole body, especially with the help from modern-day padding. But when the tackles are focused on small areas, like during a helmet-to-helmet collision, then the impacts become severe. Such collisions occur about 10 times faster than full-body tackles, Stefan Duma, a bioengineer at Virginia Tech, tells Shots. And so a player's head comes to a complete stop much more quickly than the rest of the body. Inside their helmets, they feel G-forces five times bigger than what jet pilots feel when they pull tight turns. Although these numbers are just estimates, Duma says they fit well with what he actually measures on the field. For the past 10 years, he's been putting little devices inside the helmets of Virginia Tech football players to monitor how fast their heads slow down during hard tackles. "Since we've been measuring, the hits haven't gotten stronger," Duma tells Shots. "Even 10 years ago the athletes were very strong and fast. I mean Michael Vick was on our team then." Duma says players' weights and training regimes really haven't shifted since about the '90s. "If you were really talking about changes, you'd have to look back decades." So what does this all mean for concussions and brain injuries? Neurologist Vassilis Koliatsos at Johns Hopkins University says doctors and scientists are still trying to figure that out. "Faster, heavier, more aggressive players will absolutely increase the impacts," Koliatsos tells Shots. "They are quite severe." But right now, he says, they don't have scientific evidence about what links concussions to long-term brain injuries. "There's even some concern that weaker, nonconcussive hits — although poorly defined — may also have something to do with it."